Mediterranean meditations and scenic sun salutations – the perfect backdrop for an indulgent yoga retreat to Hvar Island, Croatia. 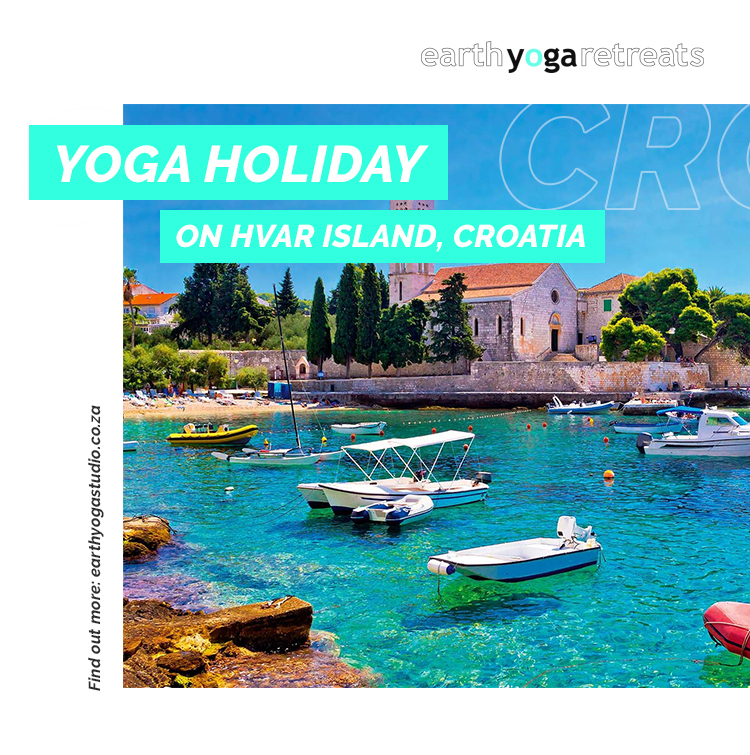 Join Izelle Nair and Stephanie de Beer of Earth Yoga Studio for a lifetime experience as they lead this rejuvenating yoga retreat to one of Croatia’s most beautiful Islands. Days will be filled with yoga and meditation overlooking an azure sea and lavender fields. You can also immerse yourself in the local culture and heritage of this beautiful Island with time spent visiting the local villages and towns. Hvar, Croatia is the perfect Mediterranean destination, steeped in ancient history and medieval tales. Vineyards and Olive groves lead to secluded villages and secret bays away from the crowds and giving time for peace. The Retreat will be based at Suncokret, a boutique yoga retreat centre, in the charming village of Dol Sveta Ana, surrounded by a pinewood forest and olive groves. Accommodation is in charmingly restored farm-style cottages with either single or double beds to choose from. The cottages have communal lounges and terraces where guests can interact, meeting as strangers and leaving as friends. Delicious meals are prepared using organic home-grown ingredients. Guests will enjoy brunch and dinner at the Retreat, with lunches being taken at leisure. All meals prepared at the retreat are vegetarian, focusing on healthy, nutritious and clean eating. This is an overall cleanse for both mind and body. Everyone can do yoga! This retreat will be open to all levels, suitable for beginners and experienced yogis. Morning sessions will be more energizing with Hatha and Vinyasa flows preparing the body for the day ahead. Evenings will be calming and meditative Yin and Restorative Yoga. Individual abilities will always be considered, allowing for greater connection to the mind through the body. Each evening different themes will be considered through Patanjali’s Yoga Sutras so that we can delve deeper into what Yoga really is! 50% non-refundable deposit to secure booking. Flights and travel expenses to get to Hvar, Croatia are for your own expense.